I'd vote for Ken Mann, Whatcom County Council. My camera got this image when he was one of a handful of politicians to show up for "Bicycle With Your Politician Day." That's an annual event sponsored by Mount Baker Bicycle Club. It takes place in May. Public officials are invited to ride along with the public on a bicycles. It's a tour through Bellingham. 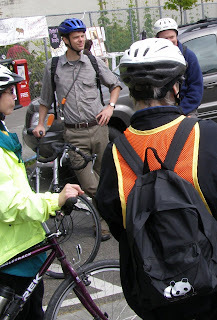 A ride to see the transportation system through "bicyclist's eyes." Like that phrase, "walk a mile in your shoes," only here, it's "bicycle peddles." Too bad I can't vote in Mann's district. I don't live in County Council District #2. While one hears that you shouldn't vote on looks, there does seem to be some connection between looks, bicycling, health and a healthy community. If more politicians showed up for events like Ride With Your Politician, we would have a healthier society.